Change Tryclyde into the Four-Headed Bulldog. Change Birdo into the Apple Bonker. Change the Shy-Guys into common Blue Meanies. Change the Ninjis into the Butterfly Stompers. Change the Bob-ombs into the Countdown Clowns. Intro - "Sgt. 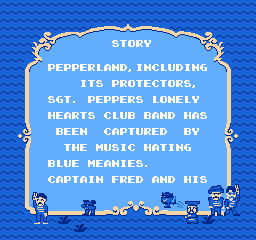 Pepper's Lonely Hearts Club Band"
Character Select - "Billy Shears" Fanfare, leading into "A Little Help From My Friends"
Stage Theme 1 - "Getting Better"
Sub Space Theme - "Fixing A Hole"
Stage Theme 2 (Indoors) - "Within You, Without You"
Birdo Theme/Boss Theme - "Being For The Benefit Of Mr. Kite"
Stage Clear Fanfare - The Intro to "When I'm 64"
Bonus Stage Fanfare - The "Ahhh ahh ahh ahh" from the intro to "Lovely Rita (Meter Maid)"
Wart's Theme - "Good Morning, Good Morning"
Ending Theme A (freeing the Subcons, Contributor Viewing) - "Sgt. 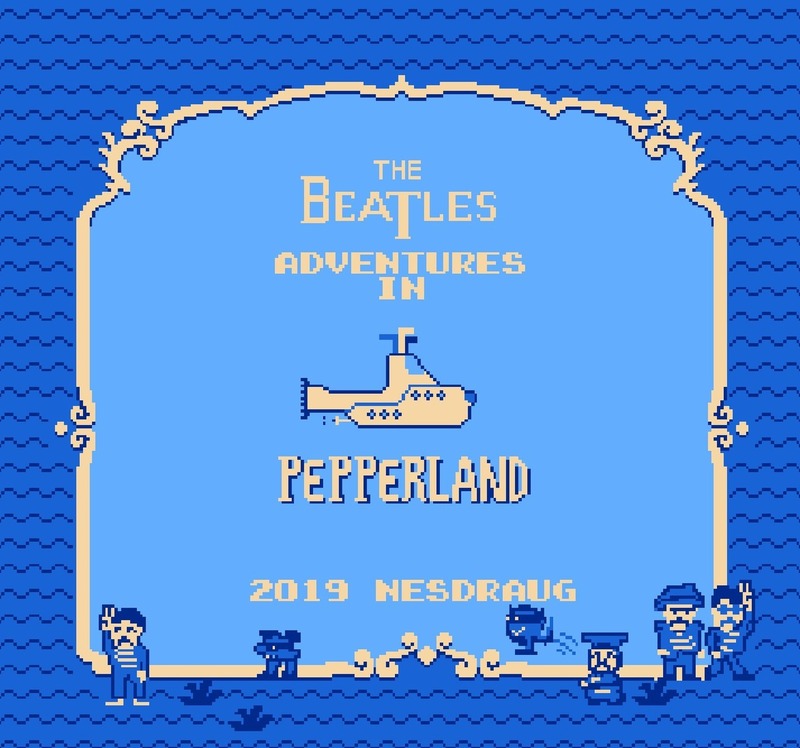 Pepper's Lonely Hearts Club Band (Reprise)"
Ending Theme B (Mario Sleeping) - "A Day In The Life"
Game Over Fanfare - The harp part at the end of "She's Leaving Home"
Really good ideas you guys! I'm starting to figure out what I'm supposed to do... and how! No, music yet. But I guess I'll have to learn. Good thing I'm a musician! I have never used Famitracker though. I’m switching from Tile Layer Pro to Tile Molester. Boy, what a difference. Now I can actually copy and paste stuff! Sure speed things up. - Finished the sprites for the playable characters. Just a suggestion. 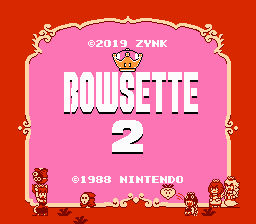 You really should improve that title screen, like what I did to Bowsette 2. Yeah, that's just placeholder. 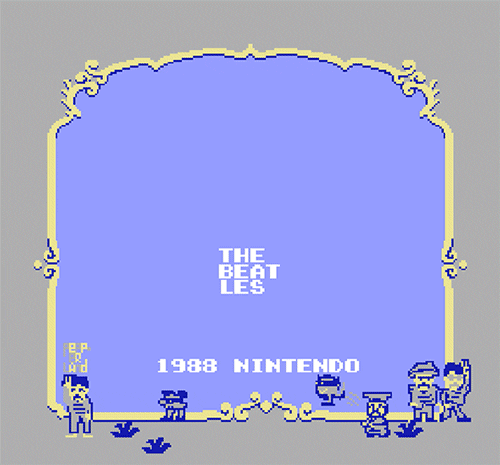 I haven't figured how to remap title screens yet. I actually opened up Bowsette yesterday in Tile Molester just to see what you've done. But I couldn't quite understand. The colors aren't that great either. Let's say I made it this ugly to remember that I have to fix it. Any help is much appreciated. Should I post in the Help thread? released a SMB2 Editor and is apparently working on a music editor. I'll have to investigate that further. Edit: OMG! this is so amazing, you guys! The editor is so dope! Also the music editor for SMB2 is confirmed! If I were you, and really serious about following through with this hack, I would consider contacting the developer and maybe get some insight in the music format. Maybe you can help each other out? In any case - good luck with this project. 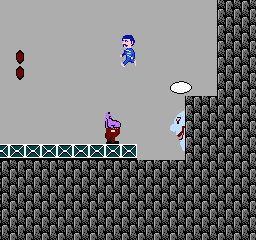 0001... = tiles used in the right side of the PPU viewer of FCEUX emulator. How about attempting for some patterned/textured blue instead of a solid colour whenever you get the chance? I should really submit that information to the website. I'll have to check that tool out. Ok, I've learned a whole lot during these weeks! 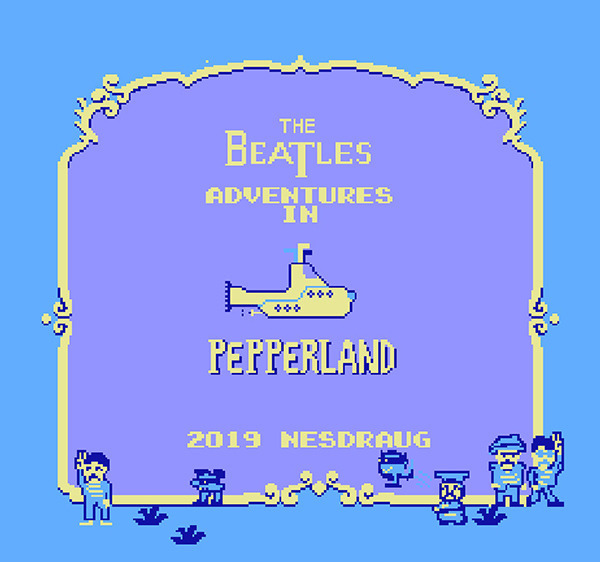 I'm pretty proud of the sprite editing, I think it's a good representation of The Beatles. Well, I'm not finished yet. 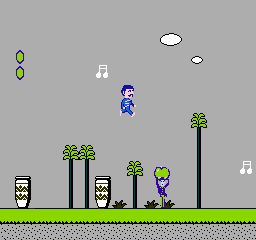 The music and a lot of graphics are still missing... aaaand custom levels would be cool. I just don't think I have the time for it anytime soon. If anyone wants to help out, please do! I think it needs a rehearsal. Seriously, I don't understand. What do you mean by rehearsal? 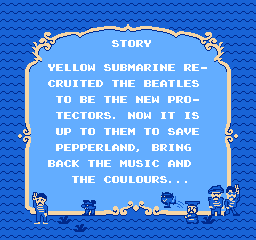 It is in fact a quote from John Lennon in the animated film "Yellow Submarine." Just a little joke.